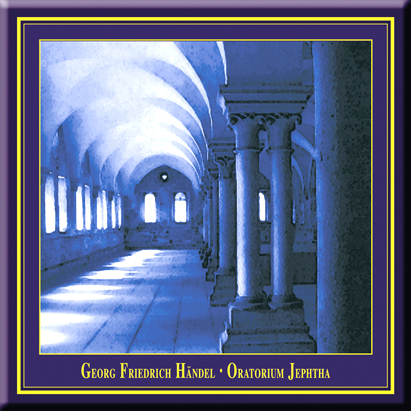 This recording is part of a cycle of old testament oratorios by G. F. Handel and is one of the many concerts performed at Maulbronn monastery over the past years. The series combines authentically performed baroque oratorios with the optimal acoustics and atmosphere of this unique monastic church. This ideal location demands the transparency of playing and the interpretive unveiling of the rhetoric intimations of the composition, which is especially aided by the historically authentic performance. The music is exclusively performed on reconstructed historical instruments, which are tuned to the pitch customary in the composers lifetime (a = 415 Hz). "Jephta" was Handel's last work of great dimensions. It was written in 1751 in London. It was performed for the first time at Covent Garden at february, 26. in 1752. Händel's last dramatical work was in the same time the most poetic of his oratories. The tension is not created by action but by the inner aspect of Jephta'ss unsolvible solitude. Expelled from Gilead by his half-brothers, he grows up in exile and becomes a god-fearing army commander, while Gilead is suppressed by the Ammonites. After 18 years of slavery, the eldest of Gilead ask Jephta to free them from their tyrants. As army commander, Jephta swears his god Jehova to sacrifice to him the first creature he will meet after victory. He can't see that it's his own daughter Iphis to take this burdon upon her shoulders. The desperation of Jephta, mother Storge and lover Hamor is met by the courage of Iphis, who comes to show herself as a true heroine. The tragical conflict of the sacrifice of his own daughter is turned to a good end, inspite of the outlines of the old testament. The music is of an overwhelming forcefulness and beauty. Jephta's importance is based in the first place on the imposing choir scenes. The choir has double function: at one hand he takes part in action actively, on the other hand he stays in the backround and comments on the story. Originally, Emma Kirkby had no expectations of becoming a professional singer. As a classics student at Oxford and then a schoolteacher she sang for pleasure in choirs and small groups, always feeling at home most in Renaissance and Baroque repertoire. She joined the Taverner Choir in 1971 and in 1973 began her long association with the Consort of Musicke. Emma took part in the early Decca Florilegium recordings with both the Consort of Musicke and the Academy of Ancient Music, at a time when most college-trained sopranos were not seeking a sound appropriate for early music instruments. She therefore had to find her own approach, with enormous help from Jessica Cash in London, and from the directors, fellow singers and instrumentalists with whom she has worked over the years. To date, she has made well over a hundred recordings of all kinds, from sequences of Hildegarde of Bingen to madrigals of the Italian and English Renaissance, cantatas and oratorios of the Baroque, and works of Mozart and Haydn. Her most recent recordings include a second volume of Handel opera arias for Hyperion, Bach wedding cantatas for Decca and Christmas music by Scarlatti and Bach with London Baroque for BIS. The American mezzo-soprano (and contralto), Melinda Paulsen, studied music at the Swarthmore College in Pennsylvania, the USA. With Bachelor of Arts with honour she came in 1988 to Germany and continued her singing study at the Munich College of Music with Professor Daphne Evangelatos in the master class which she finished in 1991. During this time she extended her repertoire with Professor Helmut Deutsch in the area of Lieder and Professor Diethard Hellmann in the oratorio. Afterwards she was engaged by the Opera Studio of the Bavarian State Opera, where she compiled opera roles with Astrid Varnay and participated in different productions in the national theatre. In 1992 she won the second prize (a first price was not assigned) in the renowned international ARD competition. Melinda Paulsen sings with renowned conductors such as Helmuth Rilling, Enoch zu Guttenberg, Rafael Frühbeck de Burgos, Marek Janowski and Roberto Abbado. An appearance led Melinda Paulsen in 1996 to Klagenfurt for a new production of the Mozarts La Finta Giardiniera (direction: Christof Loy), where her Don Ramiro became a critic success. She appeared at important international festivals, such as Wratislavia Cantans in Poland and the Bregenz Festival in Austria and in Maulbronn in Händels Jephta with Emma Kirkby. At present she is also assigned training for singing at the Johannes Gutenberg University of Mainz. Apart from her activities in the opera scene Melinda Paulsen is sought-after as Lieder and concert singer. She has made several CD recordings, e.g. Ersteinspielungen wie Lieder of Nadia Boulanger, or the Mozarts concert aria Ch'io mi scordi di te? with original instruments. The fact that her organization strength does not make stop also with works of Bach is held among other things in her participation in the current Bavarian Broadcast series of Bach Cantatas. She is to be heard also as contralto singer recording of Bachs Weihnachts-Oratorium (BWV 248) under Enoch zu Guttenberg. To her opera recordings belong the role Isaura in Rossinis Tancredi and the role of Puck in Webers Oberon. Charles Humphries studied at the Royal Academy of Music with Charles Brett, Michael Chance and James Bowman, and continues his studies with Paul Farrington. He appears regularly as a soloist, not only alongside the recognized baroque ensembles of Britain, but also in his own right throughout the UK and Europe. These appearances include venues such as the Barbican Hall, the Queen Elizabeth Hall, the Wigmore Hall, the Concertgebouw in Amsterdam and the Palais des Beaux Arts in Brussels as well as the cities of Copenhagen, Oslo, Prague and Warsaw. Conductors that he has worked for as a soloist include Sir John Eliot Gardiner, Richard Hickox, Robert King, Paul McCreesh, Nicholas McGegan and James ODonnell. Operatic engagements have included Delfa Giasone (Cavalli) at the Megaron, Athens, the titlerole in Pompeo Magno (Cavalli) at the Varazdin Festival of Baroque Music, Croatia, Lichas Hercules at the HansOtto Theater, Potsdam, the titlerole in Lucio Silla at the Handel Festival, Karlsruhe, the titlerole in Tamerlano for the BrittenPears School and The Sorceress Dido and Aeneas for the Kings Consort. Recent concert highlights have included the Chichester Psalms with the BBC National Orchestra of Wales, Hamor Jephtha at the Lufthansa Baroque Festival, televised performances of Judas Maccabaeus in Slovenia, Messiah with the Ulster Orchestra under Nicholas Kraemer, Monteverdi Vespers 1610 at the BBC Proms, Pergolesi Stabat Mater with the Northern Chamber Orchestra and a recital at the Halle Festival with Trevor Pinnock. Charles Humphries recently sang Tolomeo Giulio Cesare for the Norwegian National Opera. His recordings include Jephtha and Judas Maccabaeus (K&K Verlagsanstalt), Messiah (Capriccio) and Vivaldi Cantatas (ASV). 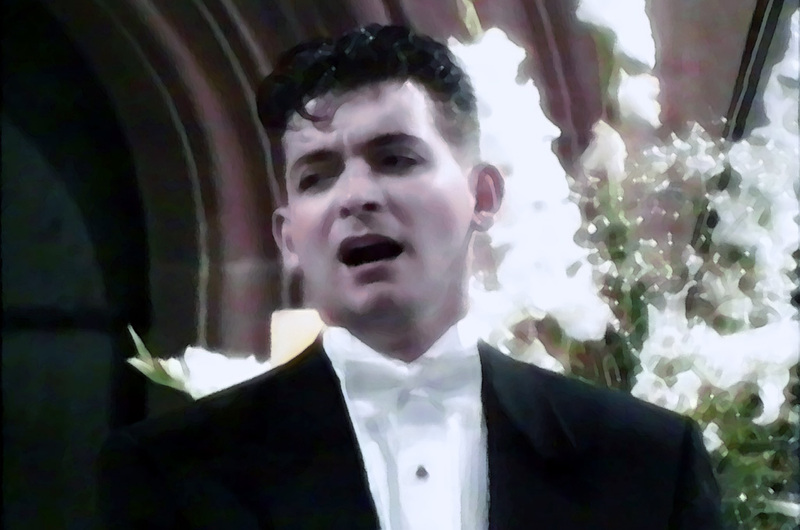 In 1987 he received a choral scholarship to study music at Trinity College, Cambridge. Today, Julian Podger is a much asked for oratorio soloist. He has recorded the arias of Bach's St. John Passion with the Scholars Baroque Ensemble and regularly performs as Evangelist. He has appeared regularly as a soloist for Paul McCreesh, Christopher Hogwood, John Eliot Gardiner and with Musica Antiqua Köln under Reinhard Goebel. He is also a member of one of the word's leading medieval ensembles, Gothic Voices, under Christopher Page, and a regular member of the Gabrieli Consort, London Baroque, the Tallis Scholars and the Harp Consort. The English bass-baritone, Stephen (Chistopher) Varcoe, studied at Cambridge, and during his school years there he sang in the Kings College Choir. In 1977 he won a scholarship from the Gulbenkian Foundation. Stephen Varcoe has established a reputation as one of Britain's most versatile baritones, and has sung in opera, concerts and recitals covering a wide range of repertoire in Europe, the USA and the Far East. He is often to be heard performing Bach Cantatas, Songs from Schubert, and Victorian Ballads. His musical repertoire is quite extensive and reaches into modern music. An area of emphasis, however, is compositions from the time of Bach and Händel. Stephen has always been fascinated by the relationship between words and music, and the role of the singer in communicating meaning to an audience and is currently writing a book on singing in English. He is in constant demand for Master Classes as a specialist in German lieder and English songs, having taught at many UK Universities and Colleges. Stephen Varcoe's operatic appearances include Haydn's L'Infedelta Delusa in Antwerp, Debussy's Fall of The House of Usher in Lisbon and London, John Tavener's opera Mary Of Egypt for the Aldeburgh Festival and Plutone in Peri's Euridice for the Drottningholm Festival, Sweden. His repertoire also includes Death in Holst's Savitr, Demetrius in Britten's A Midsummer Night's Dream and Salieri in Rimsky Korsakov's Mozart & Salieri. Stephen Varcoe has appeared with the Royal Philharmonic Orchestra, the BBC Scottish Symphony Orchestra, the Scottish Chamber Orchestra, the Ulster Orchestra, the Chamber Orchestra of Europe, the St Paul Chamber Orchestra, the Orchestre Philharmonique de Radio France, New Zealand Chamber Orchestra, the Hanover Band, at the Gulbenkian Foundation in Portugal, at the National Arts Centre Orchestra, Ottawa, with the Kings Consort, at the Festival Cervantino in Mexico, and with conductors Frans Brüggen, Daniel, John Eliot Gardiner, Richard Hickox, Lindberg, Charles Mackerras, Malgoire, Minkowski, Östman, Trevor Pinnock, Joshua Rifkin, Roszdevensky and Tortelier. Recent engagements have included Goehr's Sonata About Jerusalem with Knussen and the Schoenberg Ensemble, Bach's St Matthew Passion (BWV 244) with Trevor Pinnock in Ottawa, Bach Cantatas with the Bach Sonnerie at the Spitalfields Festival, Vaughan-Williams' Sir John In Love with Richard Hickox and the Northern Sinfonia, Webern Cantata II with Simon Joly and The BBC Symphony Orchestra, Schubert's Mass in E flat with Roger Norrington and the Vienna Symphony Orchestra and Messiah with Steuart Bedford the City of London Sinfonia. Stephen Varcoe appears regularly in recital in England and abroad and is heard frequently in recital with the Songmakers' Almanac and on BBC Radio 3. Recent recital work has included a programme of Finzi and Somervell with Iain Burnside, Schubert's Winterreise with Eugene Asti, Brahms, Schumann and Wolf at the Wigmore Hall with Graham Johnson, Grainger with Penelope Thwaites for BBC Radio 3 and Schubert and with Graham Johnson at the Bury St Edmund's Festival. Stephen Varcoe has made over 100 recordings including Purcell, Händel and Bach with Pinnock, John Eliot Gardiner, Richard Hickox and Sigiswald Kuijken, Mozart with Neville Marriner, Fauré with Rutter, Holst with Richard Hickox, Richard Strauss with Roger Norrington, recitals of Finzi and Parry with Clifford Benson and French songs with Graham Johnson, with whom he recorded Volume 2 in the Hyperion Schubert edition. He has also recorded Haydn and Grainger for Chandos with Richard Hickox and the City of London Sinfonia, Schoenberg with Robert Craft and The 20th Century Classics Ensemble and Stravinsky with Robert Craft and The Orchestra of St. Luke's. The Maulbronn Chamber Choir was founded by its director, Jürgen Budday, in 1983 and is one of the top choirs in Germany today. In addition to learning a baroque oratorio, the ensemble compiles a sacred and secular a-cappella programme every year, its focal point being 19th and 20th century literature. First prize at the Baden Württemberg Choir Competition in 1989 and 1997, second prize at the Third German Choir Competition in Stuttgart in 1990, and a victory at the Fifth German Choir Competition in Regensburg in 1998 document the chamber choir's extraordinary musical standard. The Maulbronn Chamber Choir has received, among others, invitations to the Ettlingen Palace Festival, the chamber music series of the Dresden Philharmonic, the cloister concerts at the Walkenried convent, the First International Festival of Sacred Music in Rottenburg, and the European Music Festival in Passau. The choir has also made a name for itself internationally. The 1983 debut tour through the USA with concerts in, among others, New York and Indianapolis, and the participation in the Festival of Music in New Harmony, Indiana, as well as concert tours through numerous European countries, Israel, Argentina (1993 and 1997), South Africa, and Namibia (2001) were all greeted with similar enthusiasm by the public and critics alike. The third tour through South America followed in autumn 2003 with concerts in Argentina and Uruguay. 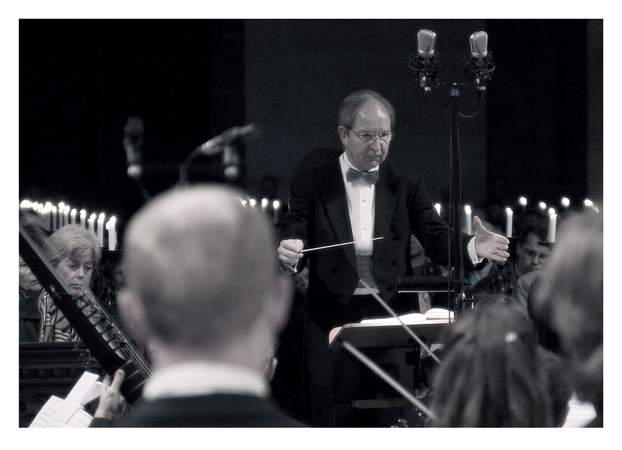 Jürgen Budday is director of church music and artistic director of the concert series at the monastery of Maulbronn, of the cantor choir and of the Maulbronn Chamber Choir. He studied music education, church music and musicology at the Academy of Music in Stuttgart and, since 1979, has taught at the Evangelic Theology Seminar in Maulbronn. For his teaching and artistic activity, he has received many awards, including the Bundesverdienstkreuz am Bande (German Cross of Merit) and the Bruno-Frey Prize from the State Academy, Ochsenhausen. Since 2002, Jürgen Budday has also held the chair of the choral committee of the German Music Council. Several concert recordings have been made under his artistic direction. They have often received international recognition and high praise from critics. These have included the Handel oratorios Jephtha, Samson, Judas Maccabaeus and Saul with Emma Kirkby, Michael Chance, Nancy Argenta and Stephen Varcoe.